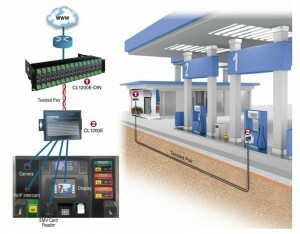 EMV card readers need Ethernet but most gas station forecourts are not wired for Ethernet. Let DCE Express show you to use your existing cable for high-speed Ethernet connections with Patton Electronics’ CopperLink. 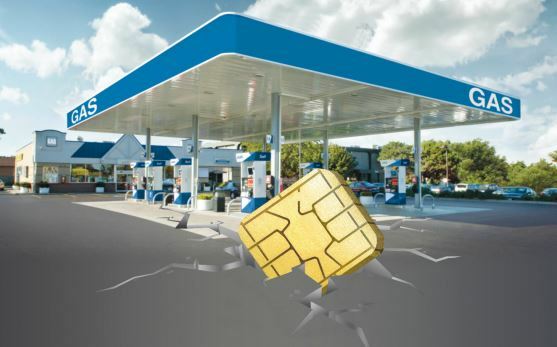 Gas station operators in the USA will soon be liable for fraudulent transactions at the pump unless point-of-sale (POS) terminals on fuel dispensers are EMV (EuroPay, MasterCard, and Visa) compliant. Starting October 2017, banks and credit card companies will shift the blame to gas station operators. Fuel merchants find themselves in need of replacing their CRIND (fuel system) and POS systems…but it is not as simple as changing the terminals. Fuel merchants have to prep their sites for EMV by enhancing site wiring to support a broadband connection to the dispensers. Today, most sites have standard twisted-pair (two-wire) connections to the fuel dispensers. These two-wire installations are intended to support low bandwidth communications such as RS-485 and dial-up. Such narrowband connections are inherently slow and are insufficient for carrying secure EMV transactions. The industry has moved to Ethernet as its primary means of communications for EMV transactions. Ethernet is flexible, deployed in virtually every industry, and is more than capable of handling the secure bandwidth-hungry EMV transactions of today and tomorrow. In order to support this Ethernet/IP broadband connectivity, fuel merchants will have to undertake the daunting task and absorb additional costs to upgrade the wiring to CAT5e/6 wiring. In most sites, this is a considerable construction project to upgrade the cable. It involves getting permits and being subjected to inspections. It includes digging up concrete to lay new conduits for cabling. This comes at a significant cost and results in downtime at the site. Downtime translates into lost revenue during construction and the loss of customers as they change their habits on where they buy fuel and more profitable items such as candy, snacks and car washes. The Solution: Don’t rewire the site—use CopperLink! There are two ways that retailers can enable broadband connectivity to their dispensers. For newer sites or sites where it is practical deploying new wiring merchants can just install CAT5e/6 cabling, which is Ethernet wiring to the dispenser. This is a reliable solution for enabling broadband communications. However it is not without its limitations. CAT5e/6 can only be run up to 300 feet, so distance is an issue. Cat5 also needs to be run in a low voltage conduit separate from any power wiring. For older sites, Patton offers CopperLink Ethernet Extenders. These Ethernet Extenders enable high speed Ethernet-based broadband signals to travel across the old two-wire infrastructure already in the ground. This makes it very easy and cost effective to upgrade any site. Simply install an Ethernet Extender in the “back room” of your site and one in the fuel dispenser. The two-wire link used for the legacy equipment is now plugged into each Extender. After powering the Extenders up they will self-configure based on the twisted pairs qualities and electrical noise surrounding that cable. Within a minute a high speed broadband connection will be established between the backroom and dispenser. It’s really that simple: we call it Plug n’ Play. Enhancing your site with Patton Ethernet Extenders, not only solves the wiring and EMV upgrade problem. These Extenders will enable your business to take advantage of other IP bandwidth intensive applications that will enhance your customers’ experience and improve your profitability. Hot applications include VoIP (phone/intercom), IP video surveillance, streaming video/apps for merchandising, and last but not least, remote management and asset tracking through the cloud. • Bandwidth up to 100 Mbps between station and dispenser. • Connects up to four Ethernet (IP) enabled devices at the pump (POS, VoIP intercom, printers, flow meters and more). • Over 30x the reach of Ethernet; eliminates 328-foot spec limitation of native Ethernet. • Protocol-transparent so no interference is caused to VoIP codec, video compression schemes, or industrial Ethernet protocols such as Modbus TCP/IP, PROFINET, and EtherCAT. • Plug and play; set and forget.